Pure, unrefined shea butter is one of my favorite ways to moisturize my face, body. Plump fine lines and wrinkles, firm and brighten my skin! 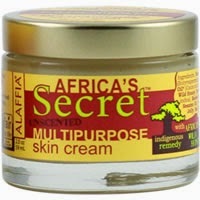 Africa's Secret Skin Cream by Alaffia is an ultra hydrating, multi-purpose moisturizer for face, body and hair. It's great for all skin types and ideal for dry skin, environmental protection, day or night cream for treating scars and skin discoloration and so much more. This precious cream is a blend of pure, whole ingredients including handcrafted shea butter, african wild honey, royal jelly, bee pollen and other natural ingredients that give your skin the best moisturizing and protective benefits without added emulsifiers, preservatives or artificial scents. African Wild Honey: Harvested sustainably in Togo from wild bee colonies. It's a potent humectant so it attracts and retains moisture. It's also an anti-irritant and has antibacterial properties. Sesame Oil: A light, easily absorbed oil rich in sesamol and sesamin, two exclusive antioxidant compounds. Royal Jelly: A complex mixture of proteins, sugar, fats and minerals & vitamins. It's especially rich in vitamin B5 which supports the healing of flaking skin and other irritating skin conditions, along with acne and even insect bites and stings. It's thought to reduce the appearances of wrinkles & other fine lines. Bee Pollen: The pollen gathered from plants by honey bees and brought back to their hive. It's a super food ingredient, containing all 8 essential amino acids in amounts between 5-7 times level found in equal weights of high protein foods. Contains Vitamins A, D, E, K, C and B complex vitamins and niacin = high mineral and antioxidant activity! Bee Propolis: Resinous substances that bees collect from plants and use to make their bee hives. It's a mixture of amino acids, minerals, vitamin A, B complex, E and flavonoids. It also has antimicrobial properties. What I love about Alaffia is all their shea butter is handcrafted, unrefined and fairly traded. So it does not go through any industrial extraction that involves the use of chemicals and high heat, which remove most of shea butter's beneficial properties. Most shea butter on the market in the United States is not fairly traded. Without fair trade, the women who gather shea nuts and hand craft this remarkable oil receive only a tiny fraction of the final price. Alaffia Shea Butter is not only one of the best you can buy, but it’s 100% fair trade certified by IMO. Africa's Secret skin cream really helped with my Eczema! It's the only skin cream I've used that gives me instant relief especially at night when I have the most flare ups. It's also very affordable! All you need is just a dab when applying to the face. Small amounts are key when using oils. For all of that and more, I highly recommend this skin cream to anyone, at any age and every skin type. Price ranges are $14 for 2 oz. and $24 for 4 oz. You can purchase Africa's Secret on their website and at Amazon.com.